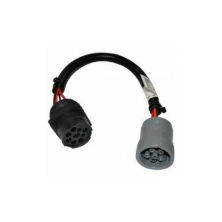 Specifically designed for connecting the Bendix Diagnostic Link Monitoring Unit 9 pin (J1939) end to a 6 pin (J1708) truck diagnostic connector. Since the Bendix DLMU has a 9 pin end it requires an adapter to connect to any 6 pin truck. This adaptor cable successfully achieves that job.